With wildly varied takes on the natural world, painters Josh Keyes and Lisa Ericson bring two separate shows to Thinkspace Projects in Culver City. 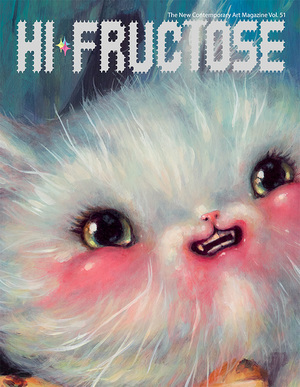 Keyes was last mentioned on HiFructose.com here, and Ericson was last mentioned on the site here. Josh Keyes further pushes his signature “eco-surrealism” with a new collection of acrylic paintings under the title “Implosion.” The new show at Thinkspace Gallery takes us to a post-human time, a bleak reality in which the natural world goes on despite the chaos we wreaked upon it. In this world, human artifacts and even animals are adorned with graffiti, our final communication with a planet we put in peril. Josh Keyes (HF Vol 12 cover artist) and Brin Levinson (covered here) both illustrate an affinity for animals in their paintings. Working in acrylic and oil respectively, their collective exhibition “Reclamation of Nowhere”, which opens tomorrow at Antler Gallery in Portland, illustrates desolate environments from the animal’s point of view. 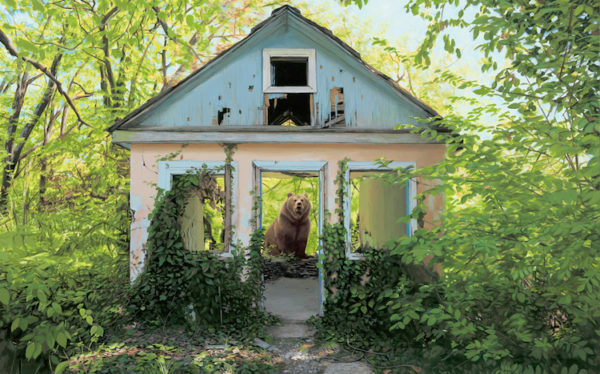 Josh Keyes chose to convey feelings of liberation and reclamation in his new series. “It is suggesting surrender, or letting go, or loosening of the psychological framework and preconceptions that can sometimes hold and restrain our imagination and natural impulses,” he explains. Check out our preview after the jump. Portland-based artist Josh Keyes (Hi-Fructose Collected Edition 3 cover artist) has always demonstrated a keen empathy for animals in his work. Where in his older paintings, majestic animals such as circus elephants seemed trapped in their captive surroundings, in his latest series the artist frees his wild protagonists. Great beasts like wolves and elks seem happily at peace in nature, their bodies fusing with the land and the flora to visualize the interconnectedness of all beings. Saddened by the cruelty endured by circus animals, Josh Keyes recently created his first sculpture based on his 2012 painting, Lifted II. The sculpture of the same title takes Keyes’s voluminous painting style into the 3D realm. Submerged figures are a hallmark of his work, creating a tension between the water’s calm and the eminent peril of a flood. Keyes says he would like to translate other paintings of his into sculptures to offer a multi-faceted perspective on his imagery. Take a look at some other images of the work after the jump.